We are just finishing our fourth month in the house and still as busy as ever!! Our to do list only gets longer and our weekends are getting more and more booked up as the summer comes to an end. 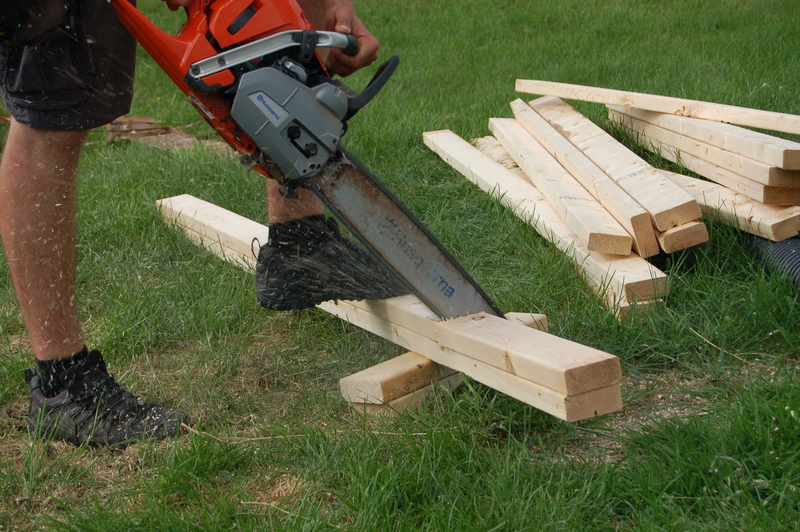 This Friday/Saturday we will be visiting some family and picking up some wood. We are intending to heat with wood this winter but are quite a few cords short. Hopefully we will be able to cut enough for the winter, it would not be awesome to have to buy it when we have it available to us through family. We should have Sunday free for work around the house. 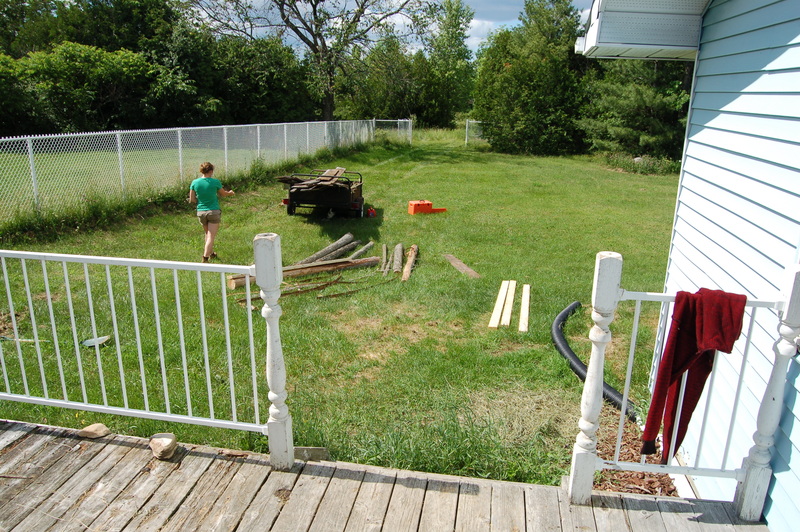 We will most likely get started building our wood shed. 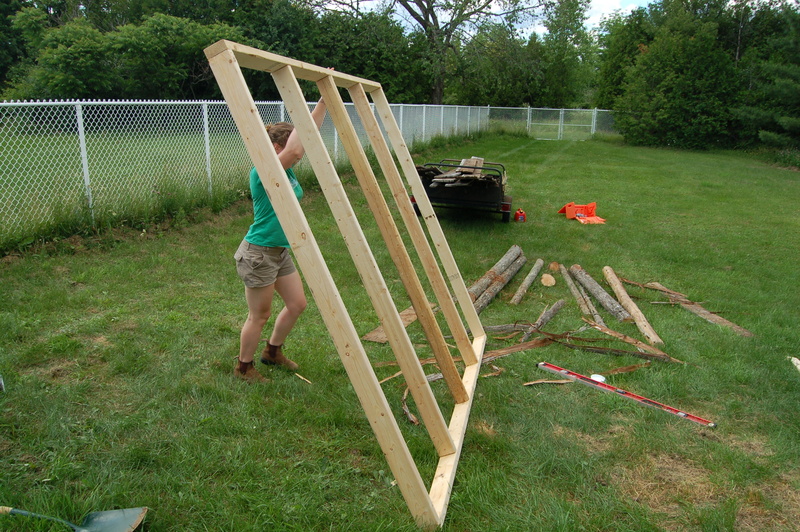 It will be a simple post and beam structure with recycled barn boards on two walls. We will also spend a few hours on sketch up working on the building plans for the barn! 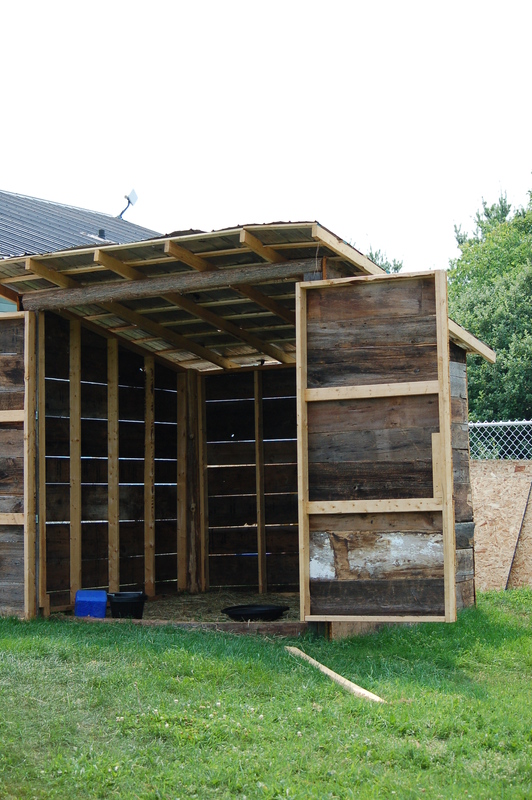 We are running out of time and need to get started on a winterized building for all our critters. 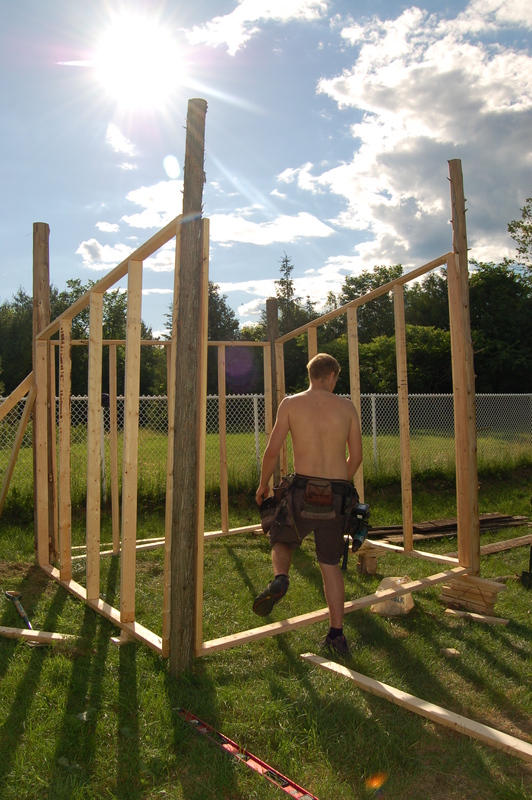 So far the plan is post and beam framing on a concrete foundation with radiant heating and straw bale insulation. It will be a very useful space containing stalls for the bucks, stalls for the does, kidding pens, a milking room, a feed and tack room and a chicken coop. There will be separate fenced in runs for the animals out back. Keep your calendars open for a barn raising party in the fall. 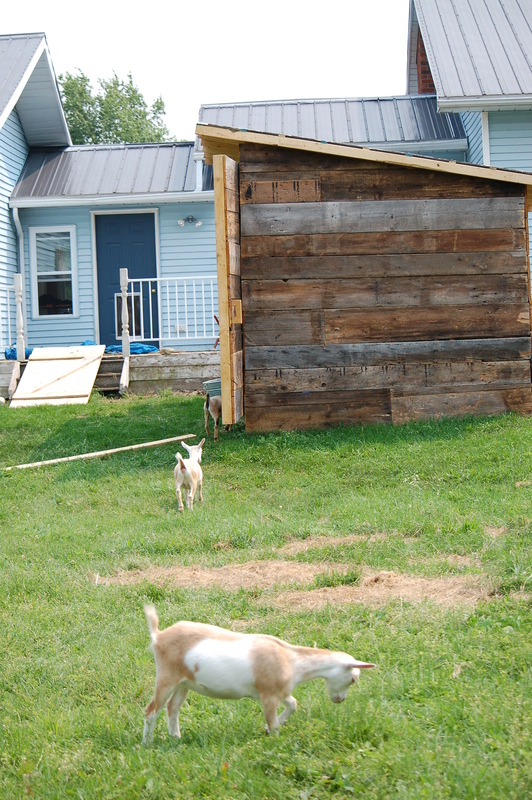 A few weeks ago we built a small structure for the goats to sleep in until the barn is built. It was a relatively quick project and looks quite nice. We grabbed cedar posts and old barn boards from Toby’s dad’s house and used some of the 2 by 4’s we had laying around at the house. 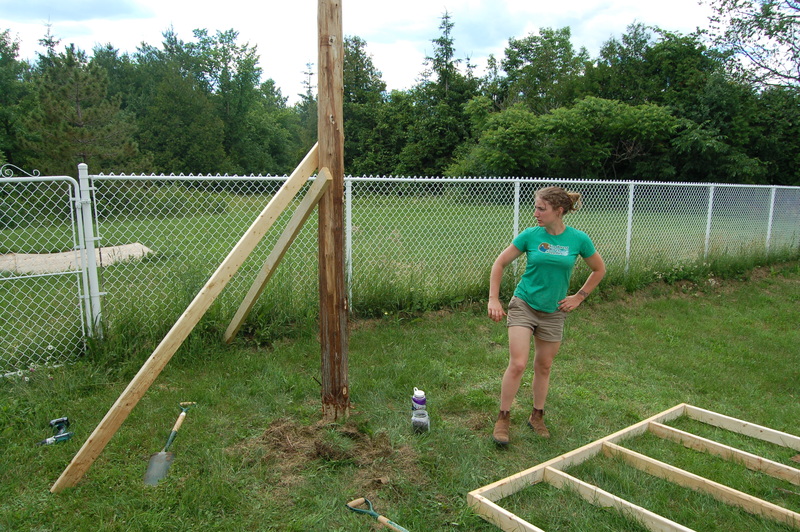 Toby built the walls on the ground, dug some small holes for the posts and propped them up so we could attach the walls. There was a pretty immediate need for the shelter so we designed as we went. Toby made sure it was as level and square as we could manage without a foundation. We attached the barn boards to the sides trimming and adjusting where necessary. Toby put together two big barn doors in no time and voila we have shelter!! Unfortunately after only one night of sleeping in the shelter the males began trying to mount the females so we had to move them into the old chicken coop on the property. For a week or two we just had sheets of aspenite on the roof. Last weekend we used some tin from Toby’s dads barn and finally put a real roof on it. We still need to tar the roof so it is sealed but it is pretty much finished. The goats love it! We are strongly considering adding goats to our farm. More specifically dairy goats. My milk cow died this spring and one of my other cows had to be sold due to disease. So we’ve thought about adding goats in with our beef cows to make better use of our pasture. Do you milk your goats? We don’t yet because they are still too young. We will be breeding them next year. 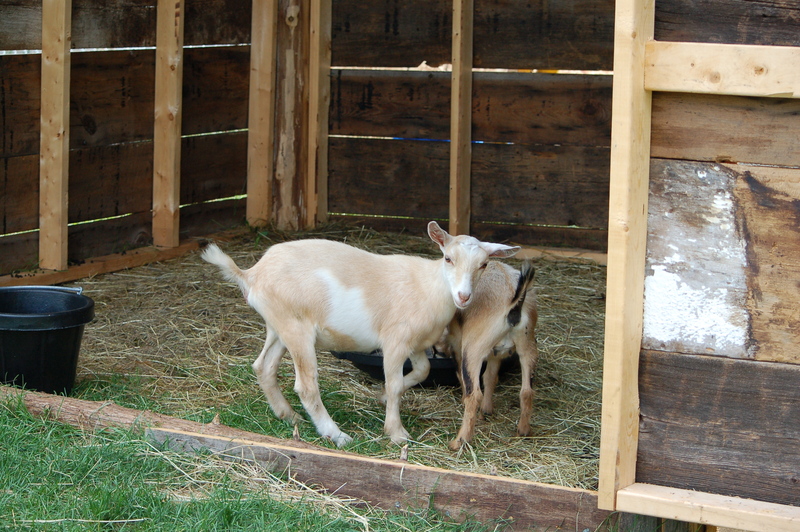 Nigerian dwarf goats can produce up to two quarts of milk per day with 8% butter fat. They are super friendly and easy to take care of! We are so happy to have them, I highly recommend the breed!